Still at the Parish Church of Saint Gwinear in Cornwall, we have another interesting grave/memorial to look at. This time it’s John Grose (the younger brother of Matthew Grose (1788-1849) who migrated to the Isle of Man). Their lives was craved but God denied. He died trusting in his saviour. What do we know about John Grose? John Grose is the son of Captain Matthew Grose (1761-1824) whose Memorial is also at Gwinear and details covered in this other post. According to the 1841 census (below) and also his 1842 Will, John Grose was a grocer and draper in Goldsithney, Perranuthnoe, Cornwall. We don’t have a baptism record for John Grose yet, but from his grave we can estimate his birth around 1793. This fits with the Cornwall Memorial Inscription record on FindMyPast. Although we have this Memorial Inscription and death record, we don’t yet have a burial record in Gwinear. 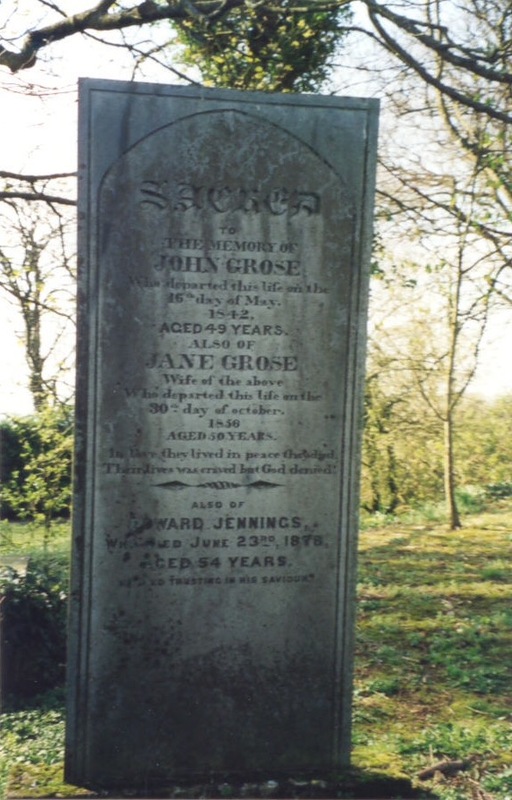 Is this headstone indicating a burial place, or memorial for John Grose? Another question: He is titled as Captain John Grose on his mother’s obituary. Was he a retired ‘Mine Captain’, or another type of ‘Captain’? What do we know about Jane Grose? According to the marriage record of John Grose and Jane Jennings on 26th January, 1840 from the Cornwall OPC Database, Jane Grose (nee Jennings) is from Gwinear and daughter of Thomas Jennings, a farmer. With further research on the Cornwall OPC Database, we see Jane’s mother is likely Ann Jennings (nee Hambly). Ann Hambly and Thomas Jennings married in Gwinear in 1802. We don’t see a baptism in Gwinear for a Jane Jennings, but we have a record for Jennifer Jennings to parents ‘Thomas and Anne Jennings’ which looks like the best match for her. From Cornwall OPC database we have a burial record for Jane Grose in 1856 in Gwinear which corresponds with the grave. What do we know about Edward Jennings? Edward Jennings is the younger brother of Jane Grose (nee Jennings). So once again a few questions answered & as usual a few more things to find out! Please comment or contact if any errors, or have advice or info. The next post will look at a third interesting gravestone at St Gwinear, Cornwall. Then we’ll go back over to the Isle of Man!